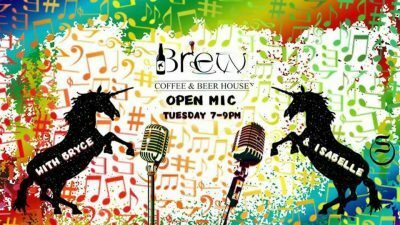 Isabelle Garson and Bryce David Dow-Williamson host open mic Tuesdays at Brew! * Play an intimate setting in 10 minute sets. No minimum share as much as you’re comfortable with. Open to anyone interested in playing music, comedy, poetry, doing spoken word or performance art… Really, the sky’s not even the limit here. Bring it. Time slots on a first come first serve basis, including bonus slots avaliable at the event only. Sign up for 10-minute time slots between 7 PM and 8 PM through Facebook Events (Brew Open Mic). Sign up for 10-minute time slots between 8:10 and 9 PM at the show right before 7 PM, plus bonus slots after 9:10 PM which may only allow time for one song, depending on how many people are playing.